The law gives each coastal nation control over an exclusive economic zone (EEZ) that extends 370 kilometers off its shoreline. But if a country can provide geological proof that the continental shelf that slopes seaward from its shore extends beyond the EEZ, it can expand its claim to seafloor resources, including oil, gas, and minerals (but not sea life in the water column), by up to an additional 278 kilometers. This “extended continental shelf ” provision has enabled some nations, including Australia and New Zealand, to expand their seabed territories by up to 50%. Some of the five Arctic nations—Russia, Canada, the United States, Denmark, and Norway—are angling for similar gains. (The United States has not ratified UNCLOS, and so cannot participate in the claims process.) In 2001, Russia staked a claim to a huge chunk of the polar sea floor, stretching to the North Pole, arguing that two underwater mountain ranges—the Lomonosov and Mendeleev ridges—are extensions of its continental landmass. But in 2002, the United Nations’s Commission on the Limits of the Continental Shelf, a 21-member technical body that evaluates the science underlying such claims, recommended that Russia revise and resubmit (Science, 6 December 2002, p. 1877). That decision helped accelerate efforts by Arctic nations to map and sample the little-studied polar sea floor, much to the delight of geoscientists (Science, 16 March 2007, p. 1525). Ships equipped with sonars and seismic mapping systems—which use sound to chart seafloor geology—crisscrossed the Arctic, aided at times by warmer summers that opened ice-locked waters. “Fifteen years ago I would have said [such a concerted effort] was impossible,” says geophysicist Wilfried Jokat of the Alfred Wegener Institute in Bremerhaven, Germany. Norway has already tapped such data to back a successful 2009 continental shelf claim. Other new data are behind the competing Danish and Russian claims. 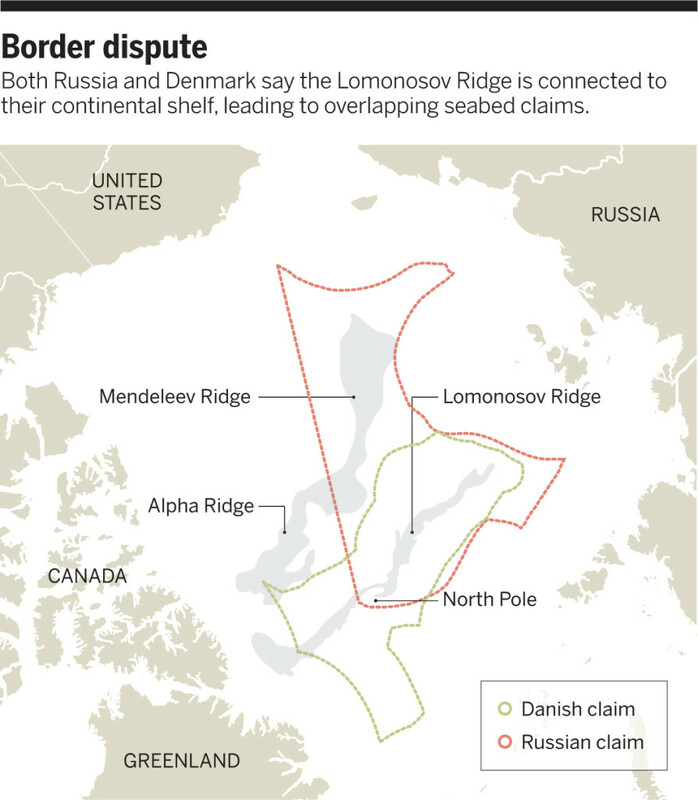 Last year, Denmark together with Greenland (which Denmark represents in foreign affairs) argued that the Lomonosov Ridge, which bisects the Arctic, is an extension of Greenland’s continental shelf. They laid claim to 895,000 square kilometers of sea floor, extending past the North Pole into areas previously claimed by Russia and Canada (see map). 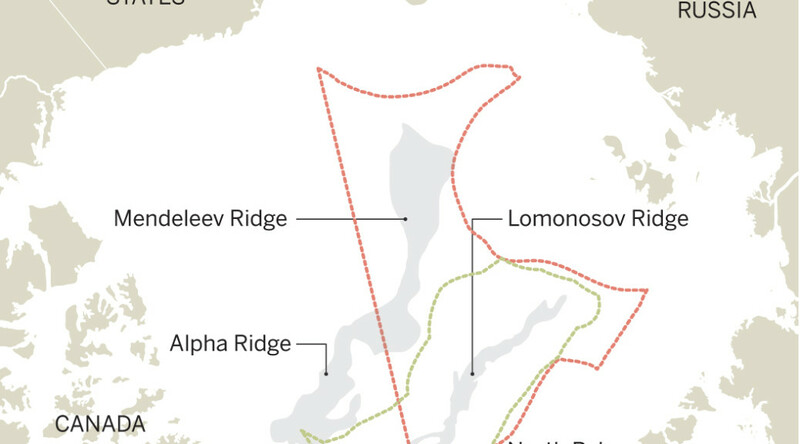 Russia’s 3 August claim, by contrast, argues that both the Lomonosov Ridge and the roughly parallel Alpha-Mendeleev ridge system are extensions of Russia’s continental shelf. And it says analyses of 120 rock samples, including basalt taken from the Mendeleev Ridge, will help back that claim. For researchers, the submissions are tantalizing. They include new data that could help resolve long-standing questions, such as whether the Alpha-Mendeleev ridge system is part of a continent or the oceanic crust, Lebedeva-Ivanova says. She’s especially interested in seeing Russia’s basalt data. But there’s the rub: The United Nations allows the full submissions to remain secret. “Nobody’s seen that data,” so it is hard for outside experts to weigh in, says marine geologist and consultant Lindsay Parson in Romsey, U.K. Still, researchers have some informed opinions. Germany’s Jokat has collected data that support the idea that the Mendeleev Ridge is part of the ocean crust. If the U.N. experts agree, that could weaken Russia’s case for a big chunk of its claim. In contrast, there’s consensus that the Lomonosov Ridge is of continental origin—potentially giving support to both Russia and Denmark. Whatever the U.N. panel decides, however, its views are advisory only; it’s up to diplomats to set final marine boundaries. It could take years for the experts to issue their opinions. In part, Lebedeva-Ivanova says, that’s because UNCLOS includes “strange,” outdated, and possibly misleading geological terminology. In the meantime, scientists fear funding to study the Arctic sea floor will decline as the competition to claim the North Pole winds down. First published by Science Magazine: [html] [pdf].